I have just 3 of these rare links left for the Heuer Montreal Bellof "pyramid" or "peaked" shape original NSA Swiss original bands. This is a difficult NSA link to source. Great item to put away for the future. 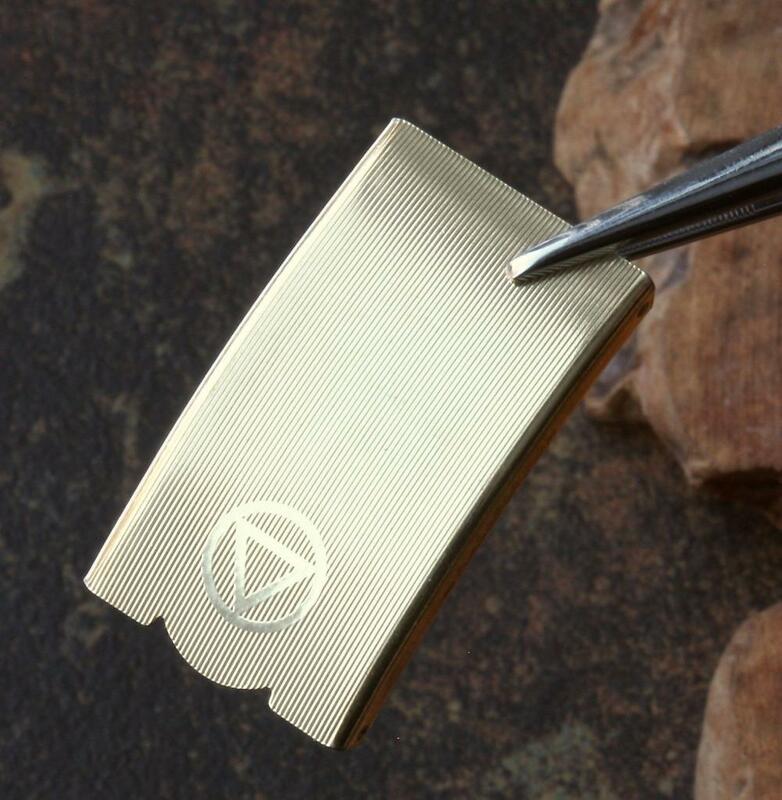 These links have a smooth, polished finish. I am offering one section of 3 links that will add 1/2 inch (1.4cm) of length, with two spare NSA link pins. These are used links from the 1960s/70s. Tuck these away because you will not be able to find them when you need some. These links have a 10mm wide center connection point and the links are 18mm wide. These attach on either side of the clasp of the original Heuer Montreal Bellof bands. NOS Bellof link set is $125 including shipping in the USA. 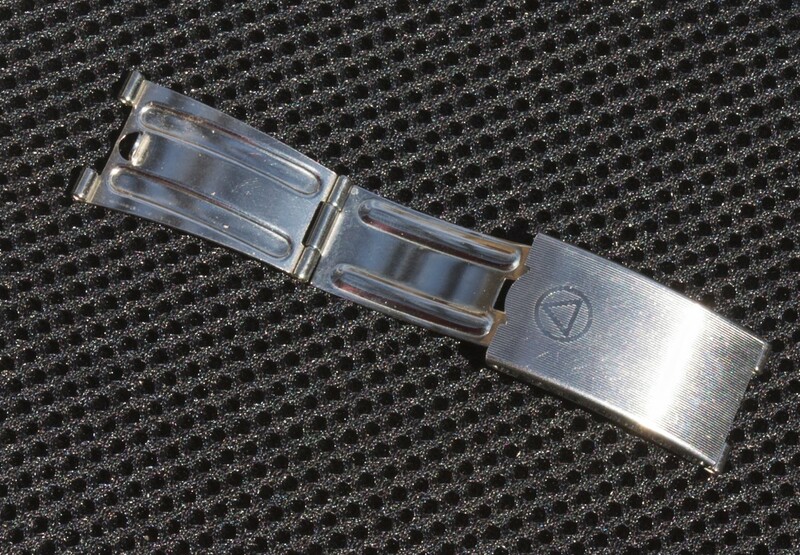 Here are other spare links and useful NSA parts for either your MkI or MkII styles of original Heuer Monaco or Heuer Silverstone stainless steel bracelets by NSA Switzerland. Also offered here are NSA clasps, clasp springs and link pin assortments. Spare links for the 2x1 Bar links for MkII edition of the Heuer Monaco bracelet and the MKI version of the Heuer Silverstone bracelet. 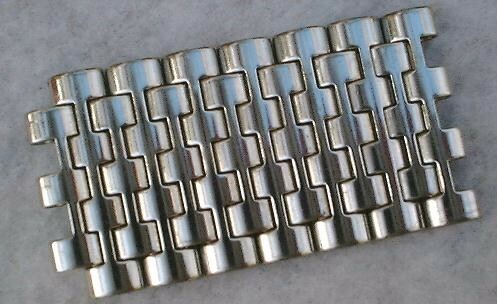 Three-row link pattern band made by NSA in Switzerland in the 1970s. 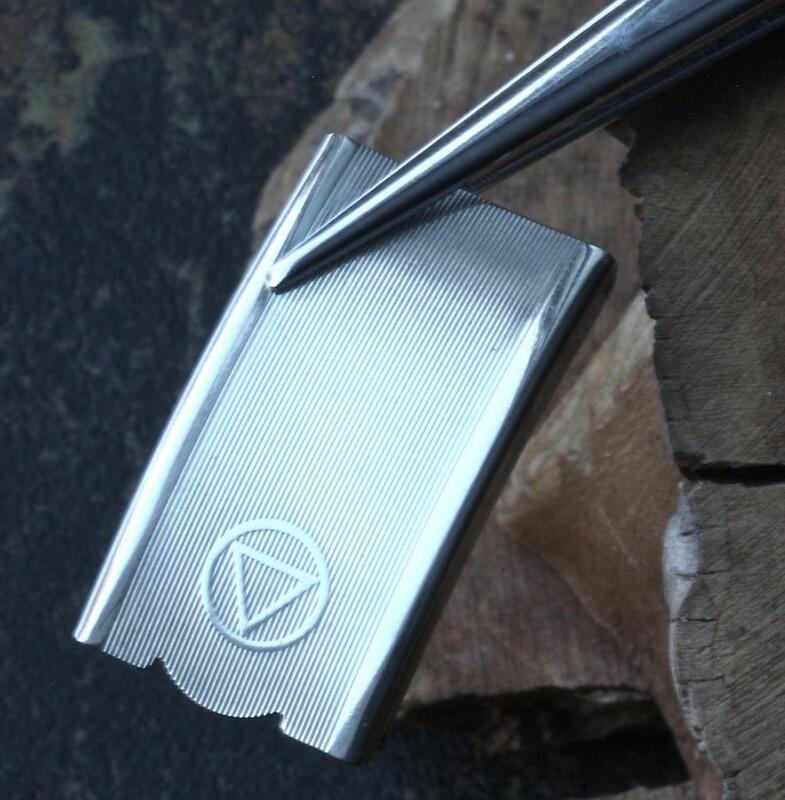 Available with a satin matte finish or a polished smooth finish. 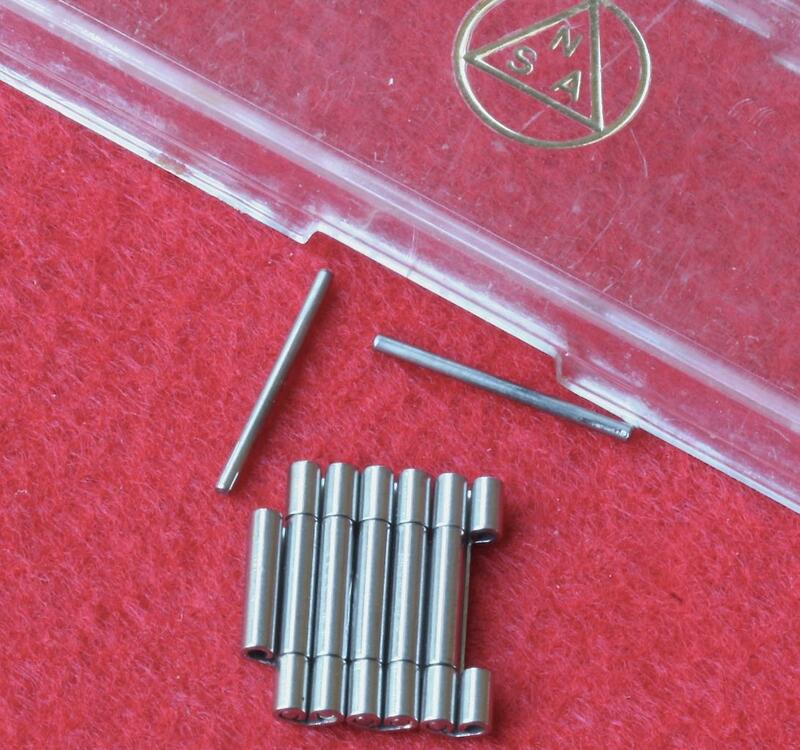 Easy to install these with the NSA band's nail type pins as shown. The links are 18mm wide. These links are used so they will blend well on your used band. Available in polished or satin matte finish. Spare links for the 3x4 row Beads links for MkI edition of the Heuer Monaco. Polished smooth finish. 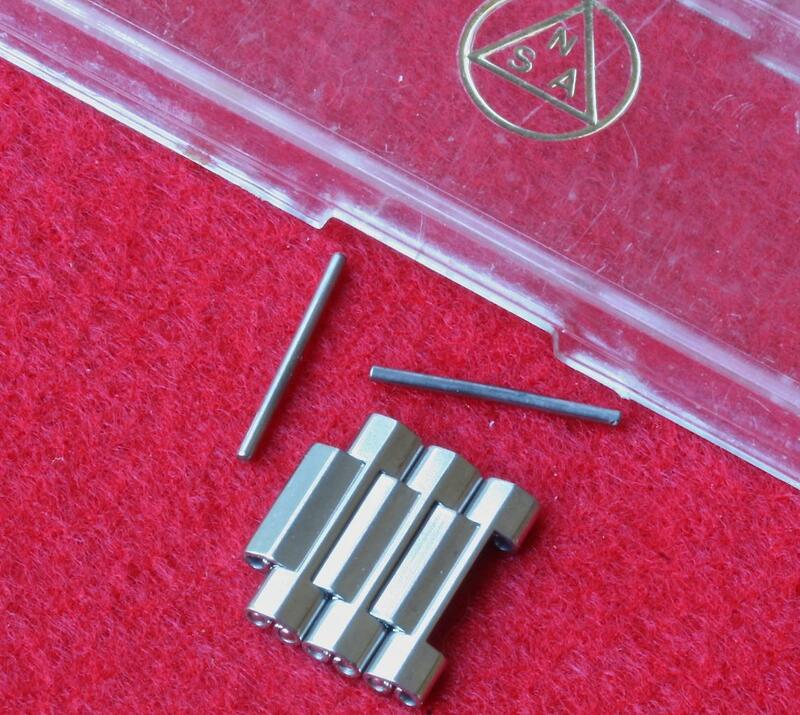 Easy to install these with the NSA band's nail type pins as shown. The links are 18mm wide. These links are New Old Stock. Spare used links for the MkII edition of the Heuer Silverstone. Polished smooth finish. 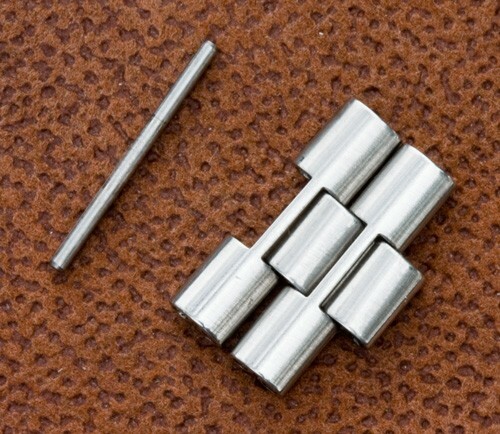 $89.99 for 4 used links measuring 3/4 inch (2cm) plus 2 link pins. If you want NOS links, they are $115 for 3 links. 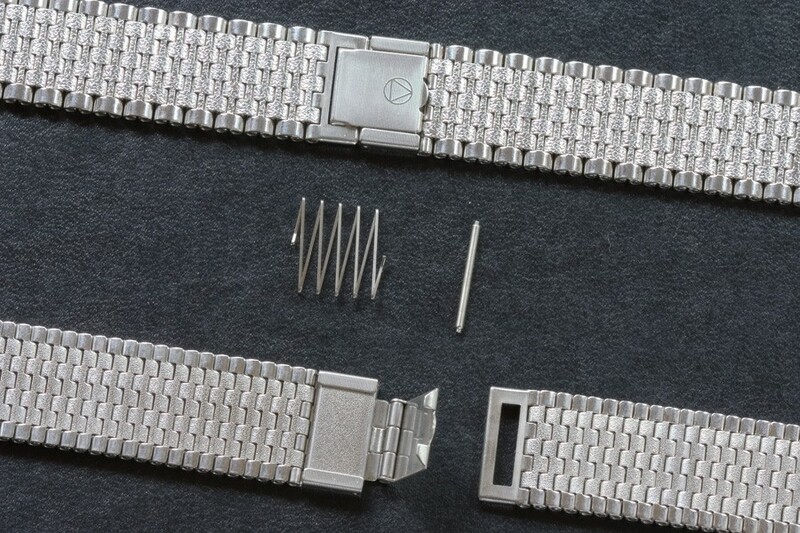 If you own a classic Heuer with a Swiss watch bracelet by NSA with the type of clasp shown in the photo above, this is a very rare spare part for that band: the small spring inside the clasp. 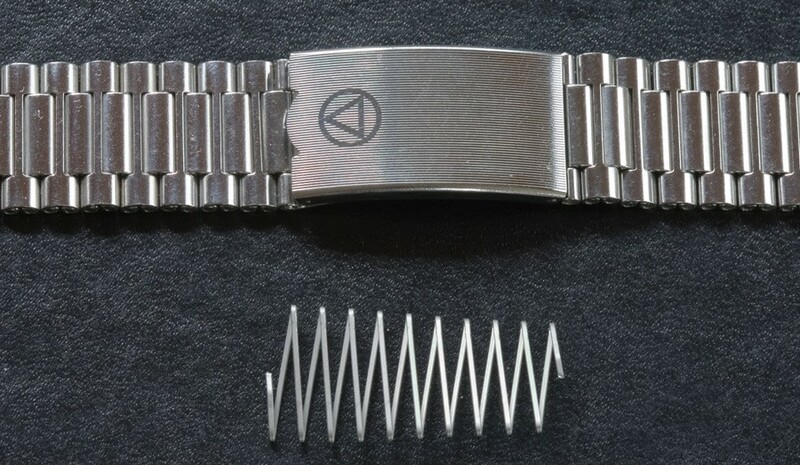 If the band is starting to slide open a bit at the clasp or is a bit sticky, the spring is probably in need of being replaced. This is the part that enables the clasp to "give" a bit, flexing in and out. It is what makes these special NSA bands so comfortable. If your spring is broken or jammed, your bracelet will not stay on tightly. 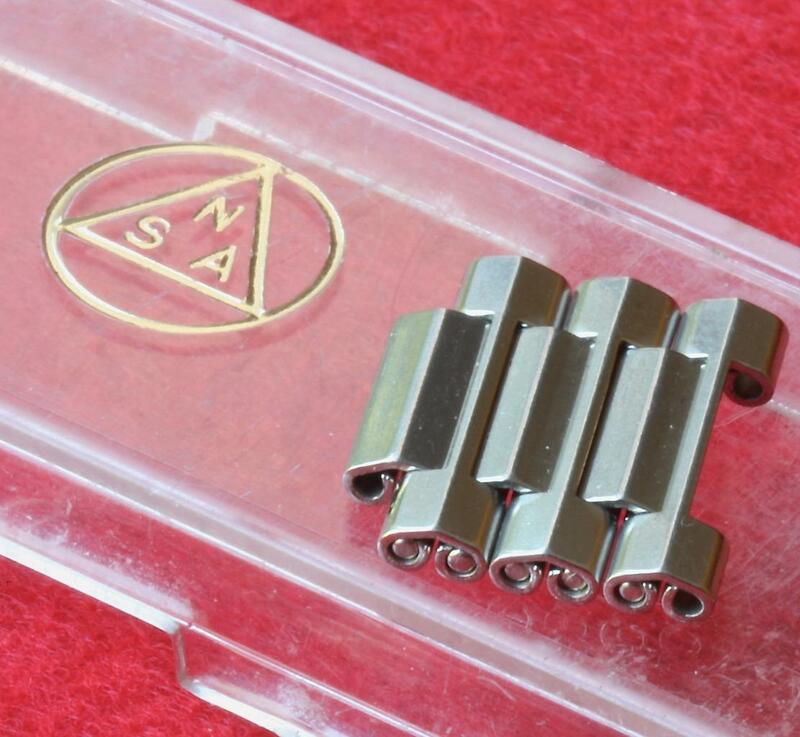 Purchase an original Swiss Made spring that fits inside the latch part of the clasp of the bands made by NSA in the 1960s and 70s. You can replace it yourself easily in about 5 minutes with no special tools. The spring a New Old Stock original part. 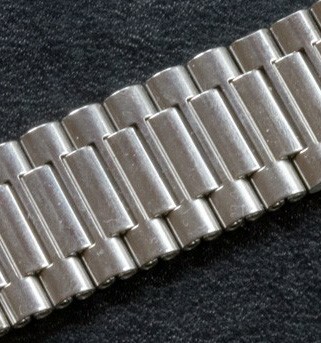 For the type of NSA clasp most commonly found on vintage Monacos and Silverstones. This is a replacement spring for the two-piece NSA clasp that comes apart. PRICE: $79.99 each for this type spring. Full replacement clasp for the type of NSA clasp most commonly found on vintage Monacos and Silverstones. You can easily replace the NSA signed “hatch” with the Heuer signed one in about 5 minutes with no special tools needed. Don’t risk your valuable Heuer on a bent or weak NSA clasp. 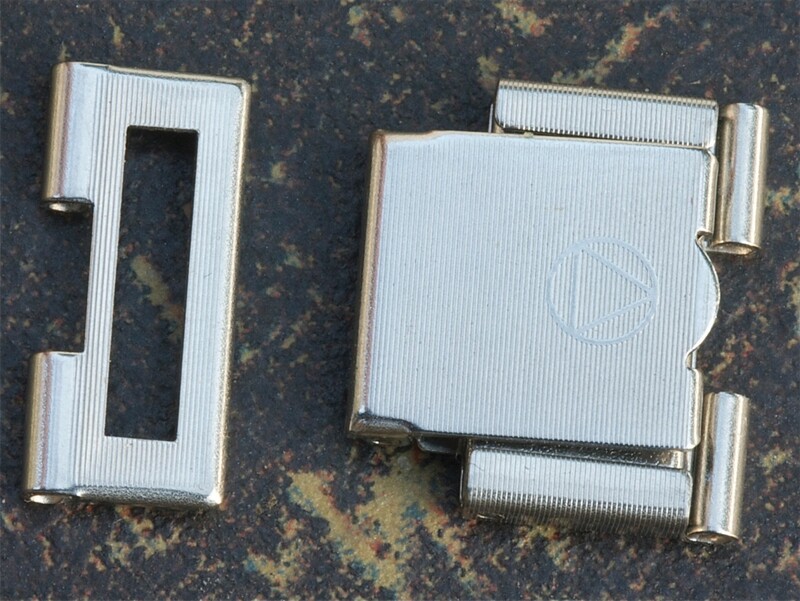 Full replacement clasp for the type of NSA clasp with the 10mm links opening often found on Heuers. You can easily replace the NSA signed “hatch” with the Heuer signed one in about 5 minutes with no special tools needed. Don’t risk your valuable Heuer on a bent or weak NSA clasp. Handy spares to have when extra links come by or when pins get bent when an NSA bracelet is being adjusted. PRICE: $20 each for a packet of 10 NSA link pins that are 18mm long and 1.1mm in diameter. Very useful to replace an incorrect signed clasp top or one with many scratches. ORDER: Please email me at billmahoney@aol.com for total shipping costs. I have many references here. I have many complete NSA Swiss bands for sale in the Heuer and NSA Swiss Bracelets sections at Squinky.com as well as spare links available for most styles of NSA bracelets.